Failed Democratic presidential candidate Hillary Clinton has sent $800,000 from her campaign funds to her new political action group, Federal Election Commission filings show. 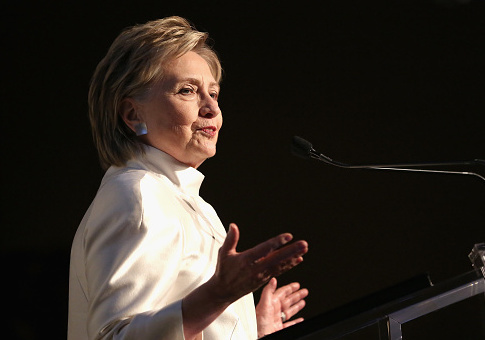 Clinton announced her intent to be "part of the resistance" in May with the formation of Onward Together, a political action group that will fund a number of established "resistance" groups that can quickly counter President Trump with direct action and protests. The group is dedicated to "encouraging people to organize, get involved, and run for office" and advancing "progressive values and work to build a brighter future for generations to come," according to its mission statement. Federal Election Commission records show that Clinton has sent hundreds of thousands from her campaign funds to her group the same month she announced its creation. Hillary for America, Clinton's campaign committee, made the $800,000 contribution to Onward Together on May 1, according to its FEC filings. Reports from earlier this year indicated that Clinton is working with former aides and donors and will assist groups that have "impressed" her since her November election defeat. Liberal groups such as Swing Left, Run for Something, and Emerge America had already received funding at the group's May 15 announcement, a Clinton aide told CNN at the time. The raucous town hall events referenced by Clinton were backed by Indivisible, another "resistance" group Clinton said she would support. Indivisible teamed up with Town Hall Project, a group that was started by a former Clinton staffer, on the events. The Town Hall Project is linked to a number of liberal groups and refers readers to the Indivisible Guide on its website. The Center for American Progress Action Fund, the advocacy arm of an organization founded by former Clinton campaign manager John Podesta, also partnered with the Town Hall Project on anti-Trump events. Onward Together is registered as a 501(c)(4) nonprofit, which means that donors can contribute unlimited sums of money while remaining anonymous if they choose. These actions run counter to what Clinton had campaigned against throughout the presidential election. Clinton's campaign could not be reached for comment on the donation to Onward Together. This entry was posted in Issues and tagged Clinton Foundation, Democratic Donors, Hillary Clinton, John Podesta. Bookmark the permalink.